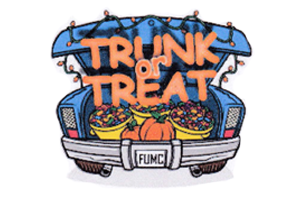 Trunk or Treat is typically held in the parking lot of a school or community center. Participants decorate the trunks of their cars for Halloween and give out candy to children. Do I need to bring candy? Yes, everyone is responsible for bringing their own candy to give out. Please only bring individually wrapped candy. Pencils, erasers, stickers, spider rings and tattoos etc. are great alternatives to candy. Oriental Trading, Party City and Dollar Tree sell those items in bulk. Do my children need to wear a costume? Children typically wear their Halloween costumes for Trunk or Treat and bring their own trick or treat bag. Please do not bring weapons of any kind. Domino's pizzas can be purchased ahead of time through Conway. You can also bring your own food and drinks. Only non-alcoholic beverages are permitted. It's also a good idea to bring a folding table and paper goods for your food, drinks and candy. How early should I arrive at Trunk or Treat? The gates at Ladue Middle School will open at 3:30 pm. All cars need to be in place by 4:15 pm. Once the event begins no cars are permitted to enter or leave the parking lot until it's over at 6:30 pm for safety reasons. Most people decorate their trunks. It's up to you how elaborate you want to decorate. Prizes will be given for best decorated trunks. Can my kids attend Trunk or Treat if I don't want to decorate my car? Yes, the event is free for kids. You can park your car at LMS outside the Trunk or Treat gates. Can I attend Trunk or Treat if I didn't pre-register? We prefer everyone pre-register to make sure we have enough spots. Can I reserve a spot next to another family? We are not able to save spots. If you want to be next to another family we suggest coming together in your own cars. We will line up cars as they arrive.